Albert Einstein was a German-born theoretical physicist, best known for his Special and General Theory of Relativity and the concept of mass-energy equivalence expressed by the famous equation, E = mc2. He received the Nobel Prize in Physics in 1921 “for his services to theoretical physics, and especially for his discovery of the law of the photoelectric effect” and he made some essential contributions to the early development of quantum theory. He was named "Person of the Century" by Time magazine in 1999, the fourth most admired person of the 20th Century according to a 1999 Gallup poll, and “the greatest scientist of the twentieth century and one of the supreme intellects of all time” according to “The 100: A Ranking of the Most Influential Persons in History” in 1978. Albert Einstein was born into a non-practising Jewish family in Ulm in the Kingdom of Württemberg, Germany on 14 March 1879. He was always a little different from other children: his head was slightly larger than normal, and he hardly spoke as a young boy, leading one housekeeper to consider him "retarded". At an early age, his family moved to Munich where Einstein attended a Catholic school and showed an early aptitude for mathematics, particularly geometry and calculus (although he disliked the school's policy of strict memorization, which he thought unhelpful). Outside of school, he explored his own path of learning in mathematics and philosophy with a medical student and friend of the family, Max Talmud. At 15, after his father’s electrical equipment business failed, he followed his family to Pavia, Italy (not wishing to stay and finish his schooling in Germany), and then on to Aarau, Switzerland, where he finally finished high school. At the age of just 16, he had already made his first conceptual breakthrough while looking at a mirror and wondering what he would see if he were traveling at the speed of light (a thought experiment sometimes referred to as "Einstein's Mirror"). In 1896, he renounced his German citizenship in order to avoid military service, and went to study mathematics and physics at the Swiss Federal Institute of Technology in Zürich, graduating in 1900. He gained Swiss citizenship in 1901 and never revoked it. Unable to find a teaching post after graduation, Einstein eventually obtained a job evaluating patent applications for electromagnetic devices at the Swiss patent office in Bern. He married a Serb woman named Mileva Maric in 1903, and the couple were to bear two sons, Hans Albert (1904) and Eduard (1910), (and possibly another child, Lieserl, before their marriage, who either died in childhood or was put up for adoption), before divorcing in 1919.
a paper on the particulate nature of light, in which he explained the “photoelectric effect” and certain other experimental results by proposing that light interacts with matter as discrete “packets” or quanta of energy, rather than as a wave (an idea first suggested by Max Planck as a purely mathematical manipulation). a paper explaining Brownian motion (the seemingly random movement of particles suspended in a fluid) as direct evidence of molecular action, thus supporting the atomic theory (that all matter is made up of tiny atoms and molecules). a paper, which has become known as the Special Theory of Relativity, on the electrodynamics of moving bodies, which showed that the speed of light is independent of the observer's state of motion, and introduced the idea that the space-time frame of a moving body could slow down and contract in the direction of motion relative to the frame of the observer. a paper on mass-energy equivalence, in which he deduced the famous equation E = mc2 from his special relativity equations, suggesting that tiny amounts of mass could be converted into huge amounts of energy (which presaged the later development of nuclear power). Much of this work was highly controversial (or just ignored) within the scientific community of the time, and he continued his work at the patent office until 1908. But he had earned his PhD from the University of Zürich in 1905, and he was eventually able to obtain a privatdozent position at the University of Bern in 1908, followed by brief teaching posts at the University of Zürich and the University of Prague in 1911. During this time he continued to publish papers, but it was only on moving back to the Swiss Federal Institute of Technology in Zürich in 1912 that he began working in earnest on a generalization of his theory of relativity. He benefitted from the mathematical assistance of his old friend Marcel Grossman, who was one of the only people in Zurich with whom Einstein could discuss his new ideas. He moved on to Berlin in 1914 (at the personal request of Max Planck), where he became a member of the Prussian Academy of Sciences, a director of the Kaiser Wilhelm Institute for Physics and a professor at the Humboldt University of Berlin, as well as maintaining an ongoing relationship with Leiden University in the Netherlands (through his contacts there with the physicists Hendrik Lorentz and Willem de Sitter). He became actively involved in anti-war demonstrations during World War I, publicly advocating civil disobedience and the refusal of conscription. Einstein gave a series of lectures in 1915 about his new theory, which was to become known as the General Theory of Relativity, including a new equation to replace Newton's law of gravity, now known as Einstein's field equation. The complete theory was finally published in 1916, although physicists and mathematicians like Karl Schwarzschild and Ludwig Flamm were starting to publish solutions to his field equations even before its publication. General relativity is based on the notion that gravity and acceleration are indistinguishable (the principle of equivalence) and describes gravity as a property of the geometry (or, more specifically, the warpage) of space-time, leading to the prediction of phenomena like the bending of light, black holes and wormholes. A year later, Einstein published a paper introducing a new notion into his General Theory of Relativity, a sort of anti-gravity force which he called the “cosmological constant” that kept the universe from collapsing in on itself, in an attempt to model the behavior of the entire universe, while retaining his firm belief in a Newtonian infinite, static model of the universe. He later called this idea his “greatest blunder” although, in the light of recent discoveries about the accelerating universe and dark energy, it is beginning to look remarkably prescient. He divorced Mileva Maric in 1919, having lived apart for the last five years, and within months of the divorce, married his cousin Elsa Löwenthal (who had nursed him through an illness) and together they raised Margot and Ilse, Elsa's daughters from her first marriage. Despite the attempts by many scientists to disprove the General Theory of Relativity, the British astronomer Arthur Eddington claimed in 1919 to have confirmed Einstein's prediction of the gravitational deflection of starlight by the Sun, leading, almost overnight, to global renown and international media attention for Einstein. His fellow scientists began to speak of general relativity in terms such as "probably the greatest scientific discovery ever made" and "the greatest feat of human thinking about nature". He was awarded the 1921 Nobel Prize in Physics, “for his services to theoretical physics, and especially for his discovery of the law of the photoelectric effect” (i.e. not for his theory of relativity). Einstein spent the next few years traveling extensively, giving lectures around the world. Throughout the 1920s, he engaged in an extended public debate with Niels Bohr and Werner Heisenberg over the inherently probabilistic “Copenhagen interpretation” of quantum mechanics, with which he was never quite happy from a philosophical stand-point, claiming in 1926 that “I, at any rate, am convinced that He [God] does not throw dice". He tried to develop thought experiments whereby Heisenberg's uncertainty principle might be violated but, each time, Bohr found loopholes in Einstein's reasoning. During the First World War, Einstein had campaigned vigorously against the war, supporting various anti-War and pacifist organizations. He remained a staunch pacifist even after the end of the War, and was highly critical of nationalism and committed to the idea of a single world government free of a military. Throughout the 1920s, he continued to participate in numerous peace campaigns and wrote articles on international peace and disarmament. He was also was drawn to the Zionist cause during the 1920s, despite its nationalistic character. His physics research after general relativity consisted primarily of a long series of (largely unsuccessful) attempts to generalize his theory of gravitation still further in order to unify and simplify the fundamental laws of physics, particularly gravitation and electromagnetism. He was desparate to come up with a unified field theory, a "theory of everything" that would refute the claims of quantum theory, which he never came to terms with. He went so far as to publish a paper in 1929, which purported to be just such a theory, and which attracted huge media attention, but he was forced to admit to errors and back-tracked rapidly, losing credibility and accepting public humiliation in the process. He became increasingly isolated in his research, pursuing his own lonely track while largely ignoring other developments in physics and particularly in quantum theory. He did pursue a few collaborations, most notably with the Indian physicist Satyendra Nath Bose, the Austrian Erwin Schrödinger and his Hungarian former student Leó Szilárd, and later in the 1930s with the Russian physicist Boris Podolsky and the Israeli physicist Nathan Rosen. But his his distrust of quantum theory and his inconclusive search for the elusive "theory of everything" was to consume him until the day he died. In the early 1930s, Einstein took to spending his winters at the California Institute of Technology in Pasadena, California, and was also a guest lecturer at the newly founded Institute for Advanced Study in Princeton, New Jersey. When, in 1933, Adolf Hitler was appointed Chancellor of Germany and promptly passed the "Law of the Restoration of the Civil Service" removing Jews and politically suspect government employees (including university professors) from their jobs, the Einsteins prudently moved to the U.S.A., buying a house in Princeton. The Nazis froze his German bank account and seized his home, and Einstein remained in the United States for the rest of his life, becoming a citizen in 1940 (although he also retained his Swiss citizenship). Over time, he became so well known in his adopted America that he would be stopped on the street by people wanting him to explain "that theory". His wife Elsa died in 1936, and his personal secretary, Helen Dukas, cared for him thereafter, as his health became increasingly precarious. During the 1930s and into World War II, Einstein wrote a huge number of affidavits recommending U.S. visas for European Jews who were trying to flee persecution. The “Deutsche Physik” movement in Nazi Germany published pamphlets and even textbooks denigrating Einstein, and blacklisting any instructors who taught his theories (including Nobel laureates Max Planck and Werner Heisenberg). With the Nazi rise to power in Germany, Einstein decided to rethink his rigid pacifist stance. Many scientists in the U.S.A., especially refugees from European anti-Semitism, recognized the danger of German scientists developing an atomic bomb during World War II, based on the newly discovered phenomenon of nuclear fission, to which Einstein’s own theoretical work had contributed to some extent. In 1939, Einstein signed a letter to U.S. President Franklin Delano Roosevelt, penned by the Hungarian émigré and physicist Leó Szilárd, urging American development of such a weapon, and this letter is considered instrumental in Roosevelt’s subsequent authorization of secret research into the harnessing of nuclear fission for military purposes (which developed into the Manhattan Project and ultimately resulted in the nuclear weapons used on the Japanese cities of Hiroshima and Nagasaki). Although Einstein himself did not play a direct role in the development of the atomic bomb, he later expressed regret about signing the letter to Roosevelt, and urged that all nuclear weapons be transferred into the control of the United Nations. In the later Cold War years, Einstein lobbied, along with Albert Schweitzer and Bertrand Russell, to stop all nuclear testing and future bombs. In politics, he was a socialist Zionist who supported the creation of a Jewish national homeland in the British mandate of Palestine, and he raised money for Zionist organizations and was in part responsible for the 1933 formation of the International Rescue Committee. In 1952, he was even invited to be Israel's second president, but he declined, claiming that he had “neither the natural ability nor the experience to deal with human beings”. In a 1949 article entitled "Why Socialism? ", Einstein described a chaotic capitalist society as the "predatory phase of human development” and as a source of evil to be overcome. He was a member of several civil rights groups, and was sympathetic to the notion of vegetarianism, adopting a strict vegetarian diet later in life. Although many religious groups have claimed that Einstein worshipped a Judeo-Christian God, he himself was quite clear on the matter, repeatedly professing himself to be a humanist and an agnostic (although not an atheist), with no belief in a personal God, which he called a “childlike” faith. The family practised no formal religion in their home and Einstein did not want his children to receive any form of religious instruction. He did, however, admit to professing a belief in “Spinoza's God, who reveals Himself in the lawful harmony of the world, not in a God who concerns Himself with the fate and the doings of mankind”, and he often expressed a continuing awe at the harmony and order of nature and the universe. 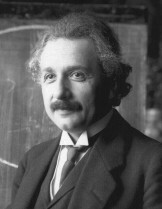 Einstein began to suffer from ill health in 1950, and eventually died of an aortic aneurysm on 18 April 1955 in Princeton Hospital in New Jersey at the age of 76, having continued to work, both on physics and on his civil rights and political concerns, until the day he died, his search for a "theory of everything" still unrealized. See the additional sources and recommended reading list below, or check the physics books page for a full list.